Fort William & Glen Spean extends from south of Fort William to a northerly point some three quarters of the way up Loch Lochy. In the west it includes the north shore of Loch Eil and all of Loch Arkaig, and in the east it extends along Glen Spean to the traditional boundary with Badenoch. For accommodation in the area see the links in the "See and Stay" menu above. See the map below for an outline of the area and links to surrounding areas. Fort William stands at the focal point of the area known as Lochaber, and stands on the shore of Loch Linnhe with the majestic Ben Nevis as its backdrop in distant views. The town takes its name from the fort that William, Prince of Orange, had built here in 1690. Though it was successfully held by government troops during the Jacobite uprisings of 1715 and 1745, the surrounding area saw great turmoil (see our Historical Timeline). Today, such a bloody past is difficult to imagine. 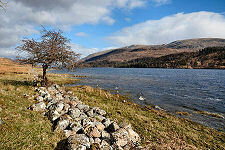 Fort William is the main centre for the Western Highlands and a magnet for tourists. There are gift shops to suit all tastes and walkers can stock up on essentials - and non-essentials - in a number of specialist outlets. Transport links to and from Fort William are very good. It is accessible by bus or by train from all points south. The scenic West Highland Railway runs from here to Mallaig. And for more local transport, bikes can be hired in the town. There's plenty to do in Fort William when weather or inclination rule out a day in the hills. The West Highland Museum in the centre of the town is excellent, while St Andrew's Church, towards the north end of the main street, has a very attractive interior. Also well worth a visit is St Mary's Catholic Church, on Belford Road, and no visit should be considered complete without a look at the Old Fort, almost invisible to passing traffic on the shore of Loch Linnhe close to the roundabout at the northern end of the dual carriageway bypassing the town centre. At the north end of Fort William, overlooking the roundabout at the junction with the A830 to Mallaig, is Ben Nevis Distillery. This is not Scotland's prettiest distillery, but it does have a lot to offer in the way of charm and a friendly welcome. Just off the main road en route to the distillery is the original medieval fortress of Inverlochy Castle. This should not be confused with Inverlochy Castle Hotel, three miles to the north of the town, and which describes itself as "Scotland's finest luxury hotel", a claim unlikely to be challenged by anyone who has had the pleasure of staying. A little further west, just off the Mallaig road near Corpach, you can explore Neptune's Staircase, the flight of eight locks near the southern end of the Caledonian Canal. Also in Corpach is the wonderful collection of crystals, gemstones and fossils at Treasures of the Earth. In some ways, Fort William's major attraction is Ben Nevis, at 4,406ft or 1,344m Britain's highest mountain. This is reached from Glen Nevis, also the starting point for a great number of other walks, ranging from the strenuous to the much less so. The gorge at the east end of the Glen gives access to the 100ft high waterfall at Steall Meadows. 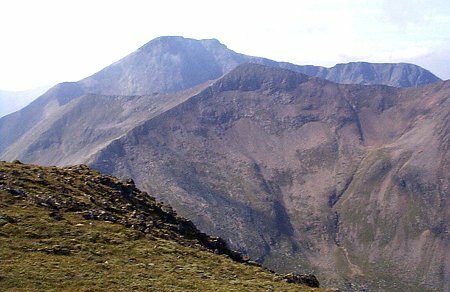 For the more energetic, there are miles of walking and ten Munros (individual mountains over 3,000ft or 914m) to be had in the beautiful Mamores. North of Glen Nevis lie ten more Munros including Ben Nevis itself and a number of more remote and thankfully much less visited peaks such as Aonach Mor and Aonach Beag. Glen Nevis also provides the route into Fort William for the steady stream of footsore individuals completing the 96 mile West Highland Way from Milngavie on the outskirts of Glasgow. Nearby is the start of Scotland's newest long distance footpath, the 73 mile long Great Glen Way from Fort William to Inverness. This can easily be combined with the West Highland Way to produce a fortnight's walking from Glasgow to Inverness. Four miles outside Fort William is Nevis Range, a year-round resort with a mountain gondola. The gondola runs all year and allows visitors to journey half way up Aonach Mor, a 4,006ft mountain. The views from it are spectacular and appear in an ever changing panorama on the 15 minute ride. Four miles further is the village of Spean Bridge. The Commando Memorial, just north of the village, is a poignant spot and also an excellent viewing point for Ben Nevis, the Aonachs and the Grey Corries. Beyond the Commando Memorial is the minor road to one of their main training areas: the wild and very lonely Loch Arkaig. The Commando Basic Training Centre was at Achnacarry Castle, where you can still find the excellent Clan Cameron Museum. Beyond the remote western end of Loch Arkaig are the ruins of Tigh nan Saighdearan, a small government barracks from the Jacobite era. Taking the right turn at the junction in the centre of Spean Bridge puts you on the A86 past Roybridge en route to Kingussie and Aviemore. North of Roybridge is the spectacular Glen Roy, complete with the still visible parallel lines left by the shorelines of glacial lochs. Driving Tours: Fort William is the starting point for our Fort William & Skye Driving Tour and our Fort William & Ardnamurchan Driving Tour.